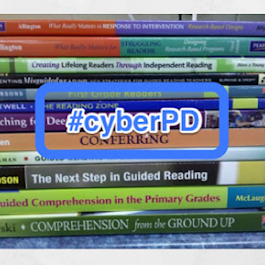 This is the third week of #cyberpd, a virtual book talk, that I am participating in this summer. Those in the #cyberpd community are reading and discussing DIY Literacy: Teaching Tools for Differentiation, Rigor, and Independence by Kate Roberts and Maggie Beattie Roberts. This week our focus is on the last two chapters of the book. 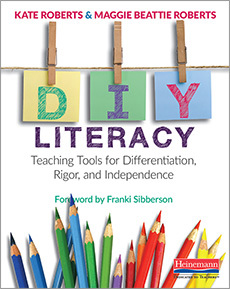 Chapter five of DIY Literacy addresses an obstacle facing all teachers: finding ways to effectively differentiate instruction for the varied learners in our classrooms. The authors discuss how teaching tools can help us meet students' needs and provide individualized instruction during conferences and small groups. If students are ready to be pushed to a higher level, a teacher can use a demonstration notebook to teach them a more complex skill or strategy. Teaching tools can also help students differentiate for themselves by reminding them of skills and strategies they can use when they are having difficulty or are ready to try something new. For example, creating an If/Then chart provides students with a list of strategies to choose from and helps them become responsible for their own differentiation. In addition to this book discussion, I participated in a virtual book discussion of Who's Doing the Work: How to Say Less So Readers Can Do More by Jan Burkins and Kim Yaris this summer. One of the main takeaways for me from the book is that teaching should support students in learning to make decisions about their reading so they learn to be independent. I am guilty, at times, of making decisions for my students. 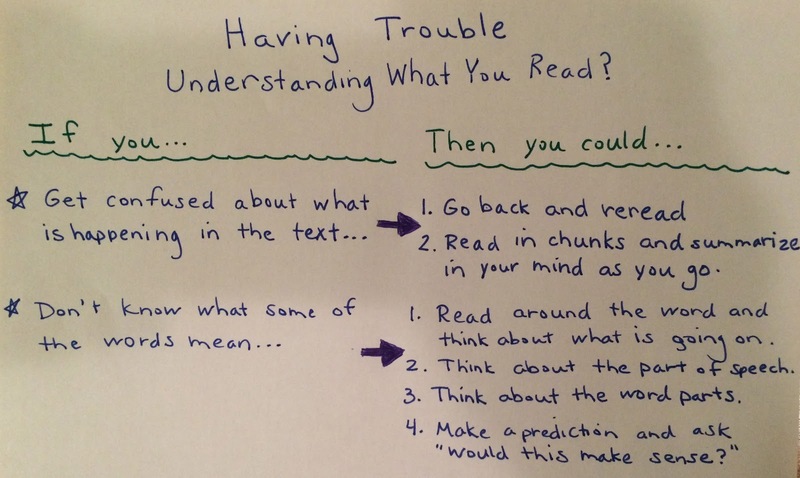 For example, when students get stuck in their reading I often prompt them to use a specific strategy. I have done this in the best interest of my students since I feel my prompting is helping students engage in useful strategies, but when I tell students exactly what to do I am not letting them figure out how to work through the tricky parts themselves and make their own decisions about what to do. 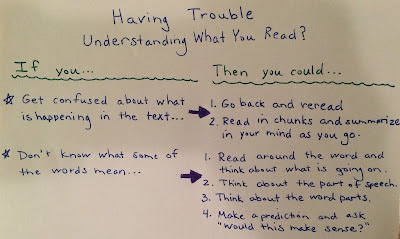 I think a teaching chart, such as this If/Then chart can support students as they learn to work through problems within their reading and make their own decisions about strategies they could use. After students have had multiple opportunities to engage in the strategies with the support of the teaching chart, the goal would be for them to independently use the strategies without needing to reference the chart. As I was creating this teaching chart, I was thinking about my messy handwriting, questioning the use of the colors of the markers I used, and critiquing my artistic skills (I should be able to draw something as simple as an arrow a little better!). Chapter six of DIY Literacy addressed many of these issues and provided tips for making charts both appealing and engaging. I was very relieved to read this at the end of the chapter: "But in the end, it is far, far more important that teaching tools be helpful to kids, not attractive" (p. 104). Although I don't want my teaching tools to be so messy students can't or don't want to read them, I feel that this gave me permission to do the best I can. Not too long ago, I heard someone use the phrase "pinterest classroom" and talk about how it's not the bright borders, fancy posters, and themed decorations hanging on the four walls of a classroom that really matter, but the quality of the teaching and learning that occurs within those walls. My charts and other teaching tools will probably never be pinterest-worthy, but if they help me be effective at building student ownership and agency then they will be beautiful to me! I also enable my students with giving them the strategy. Every summer PD has involved students' ownership of their learning and I need to ask better questions. It's important to build student ownership - always a great topic for PD. I'm also always trying to learn more about how to support student ownership and independence. If/then charts is something I want to try. Thank you for the great example of how it can be used and the reminder of why it is so important for students to choose the strategy to use and own the process of working through the tricky part! It's not a perfect example, but it helped me to start thinking about how I'll use charts in that way. Your chart is great! I would only suggest trying different colors; like maybe your first "if" in one color and connecting "thens" in matching shades? Just a thought! Thanks for the tip on color. I'll have to make sure to get one of those large packs of Sharpies that have a range of different colors. Reading about color and how it relates to memory would be interesting. I'll have to google it and see if I can find anything.